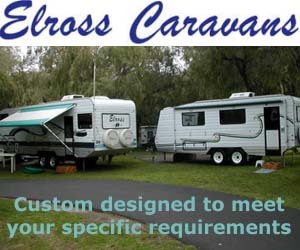 The Elross Caravans is located at 22 Clapham Street, Beckenham in Perth Western Australia. Elross Caravans are built for people who require a caravan that will fill all their needs with a minimum of compromises. To achieve this we sit down with the client and discuss all their requirements such as distances to be travelled, road surfaces expected, length of time the caravan will be used as their home, their essentials for inside fixtures; fittings and type of vehicle that will be used for towing. Not unlike an Architect who designs a house to suit their customers needs, we build a caravan to suit our customer's needs, using the best technology available. Telephone: 08 9458-6119; Fax: 08 9458-6758 or Online: Click Submit Enquiry button on the right. Please let the company know that you have seen their photos on Caravan Park Photos. *** For more information, photos and resources visit the Elross Caravans website. Photos on this page were supplied by Elross Caravans in March 2010. 2007 saw Ean and Carolyn retire to travel around Australia in their custom built Elross 5th wheeler caravan. Leaving David to realise his ambition to rebuild and expand the company. Since then Elross has expanded considerably and to that end is still doing so.